RICHMOND, Va. -- A storm system will track east and end the threat of rain by late Sunday. Due to previous rainfall and melting snow, many area rivers have flood warnings in effect. Click here for the latest river stages and forecasts. 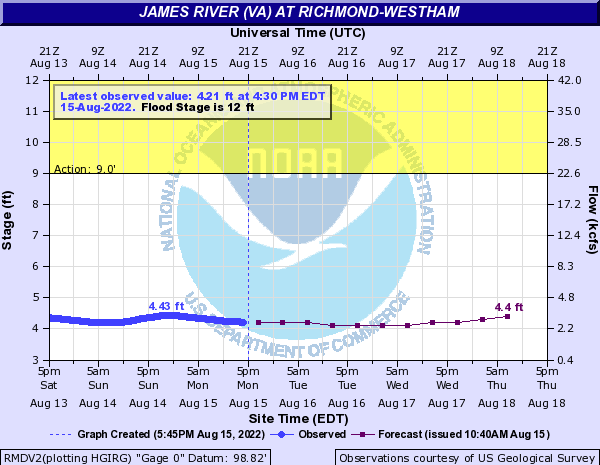 The James River at Westham is expected to crest a few feet above flood stage, then drop below flood stage Tuesday. We will have dry weather Monday through Wednesday. The next storm will bring rain Thursday into Friday. Over one-half inch of rain will be possible. That storm will exit and next weekend will be dry for much of the area, but there could be some snowflakes near the West Virginia border on Saturday. Looking ahead to next week, no major storms are expected for Christmas Eve or Christmas Day. A disturbance may cause a shower, but even that chance looks fairly low at this point. Highs will be in the 40s.